Hello! Vbites currently have a few offers on their site, including some short dated slices for just £1.00 and spicy bean bites for £1.00. These offers are on while stocks last Just go to www.vbitesfoods.com and have a look around! I have noticed this happens quite a lot on their site for various items (yay!) 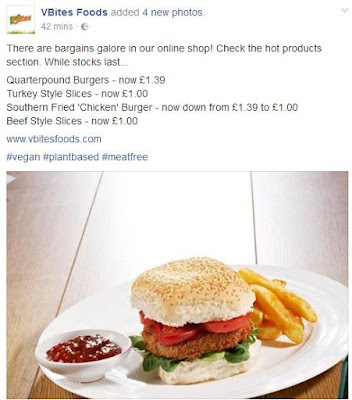 and the best place to be first to know when offers go on their site is to follow their Facebook page (https://www.facebook.com/vbitesfoods/) where they up posts such as the one below to alert you to new offers on their site! It is worth noting there is a minimum order spend of £15 and delivery charges based on how much you spend, however since the offers are usually great (often £1.00), if your favourite or hard to find products is available it may be worth stocking up on a good offer!